NBC 6 has team coverage as the deaths of eight people inside a nursing home Wednesday morning continue to be investigated - with criminal charges being filed still a possibility. Eight residents at a Hollywood, Florida, nursing home left without power in the aftermath of Hurricane Irma have died, officials said Wednesday morning. Four of the deaths happened at the Rehabilitation Center at Hollywood Hills, and three others died later at a nearby hospital, officials said Wednesday. An eighth person died at the facility Tuesday night and was taken to a funeral home. Florida Gov. Rick Scott ordered the Agency of Health Care Administration to issue an emergency moratorium for the Hollywood facility. The moratorium prevents the nursing home from admitting any patients until it's lifted. 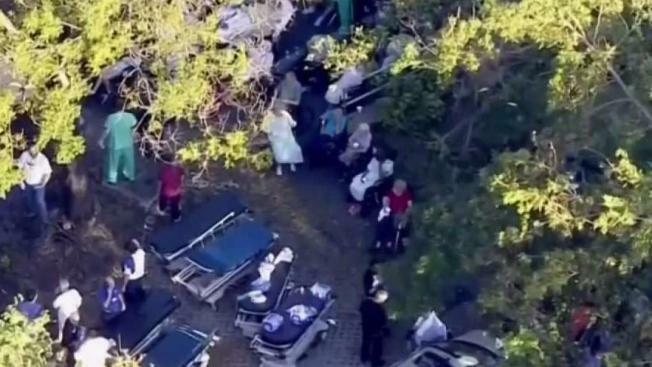 Late Wednesday afternoon, a second nursing home in North Miami Beach evacuated 84 patients. The evacuation happened after one of the generators failed at Krystal Bay Nursing & Rehabilitation Center along West Dixie Highway. Five patients were taken to Aventura hospital as a precaution due to dehydration. The other patients were transported to 13 other facilities throughout Miami-Dade and Broward counties. Aerial footage showed workers placing patients into vans in the parking lot. 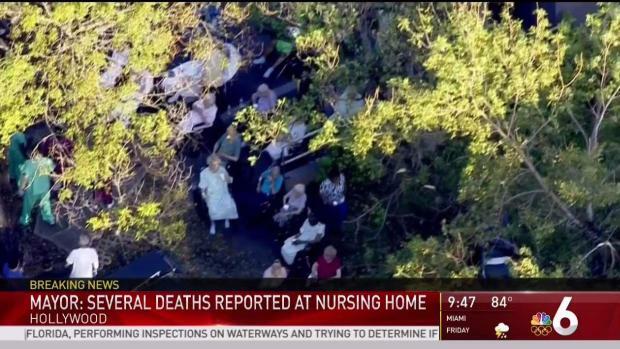 The patients were evacuated to prevent a similar tragedy that occured at the nursing home in Hollywood. Officials released the names of the eight victims at the Hollywood facility: Bobby Owens, 84, Manuel Mario Medieta, 96, Miguel Antonio Franco, 92, Estella Hendricks, 71, Gail Nova, 71, Carolyn Eatherly, 78, Betty Hibbard, 84 and Albertina Vega, 99. The causes of death have yet to be determined. Rescue crews responded to the facility at 1200 N. 35th Avenue early Wednesday and found patients "in varying degrees of medical distress," with some in critical condition, Hollywood police said. A total of 158 people were evacuated from the home and taken to area hospitals "due to conditions in the facility," Hollywood police said. The facility was evacuated due to a "prolonged power failure" to a transformer which powered the facility's A/C system, the facility administrator, Jorge Carballo, said in a statement to NBC 6. Carballo also added that the center had a generator on standby that powered life-saving devices and seven days of food, water, ice and other supplies. "Additionally, when the transformer powering the A/C went down, staff set up mobile cooling units and fans to cool the facility. Our staff continually checked on our residents' well-being—our most important concern—to ensure they were hydrated and as comfortable as possible," said Carballo. Hollywood Police Chief Tom Sanchez said investigators believe the eight deaths were heat-related, and added: "The building has been sealed off and we are conducting a criminal investigation." He did not elaborate. Officials with Memorial Regional Hospital said the patients were treated for respiratory distress and heat-related issues, including dehydration. Some of the patients were taken to area hospitals including Memorial Memorial Regional Hospital South, Memorial Hospital West, Memorial Hospital Pembroke, Memorial Hospital Miramar, Cleveland Clinic, Broward Health and Aventura Hospital, officials said. "We extend our deepest sympathies to those who lost their loved ones. Because of the current investigations associated with these tragic events involving the nursing home, we are limited in what we can say. What we know now is that a portion of the facility did, in fact, have power, that there was a hospital with power across the parking lot from this facility and that the nursing home was required to have a permanently installed, operational generator. In March, we met with Broward county officials to identify top critical facilities that require priority power restoration. While this nursing home was given a level of priority, in working with county officials, other critical facilities, such as hospitals and 911 centers, were identified as higher priorities." 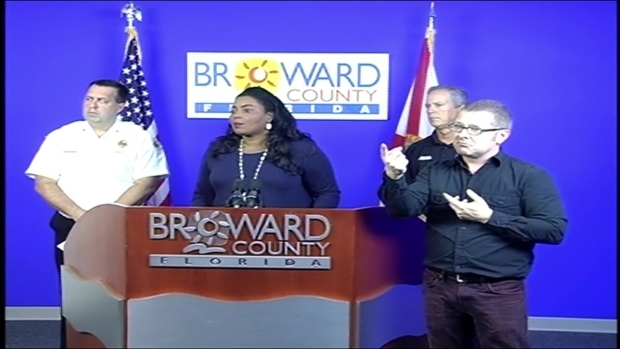 Broward County Mayor Barbara Sharief says five people have died at a Hollywood nursing home that was left without power after Hurricane Irma. Calls to the owner and other officials at the Hollywood home were not immediately returned, but the facility's administrator, Jorge Carballo, said in a statement that it was "cooperating fully with relevant authorities to investigate the circumstances that led to this unfortunate and tragic outcome." Five other people have died in the Orlando, Miami and Daytona Beach areas of carbon monoxide poisoning from running generators after Irma left them without power. Their deaths were among 13 storm-related fatalities reported by the Florida Division of Emergency Management as of Tuesday afternoon. Officers are checking all of the other 42 assisted living facilities in Hollywood as a precaution, officials said. Approximately 150 facilities out of the nearly 700 facilities in the state do not currently have full power restored, according to the Florida Health Care Association. Family members can inquire about the welfare of a loved one by calling Memorial Regional Hospital at 954-265-3000 or 954-265-1074. Florida Gov. Rick Scott said he was "heartbroken" to learn of the deaths at the nursing home. He announced the Florida Department of Children of Families and the Agency for Health Care Administration have begun an investigation. "I am going to aggressively demand answers on how this tragic event took place," Scott said in a statement. "Although the details of these reported deaths are still under investigation, this situation is unfathomable." U.S. Sen. Bill Nelson, D-Fla., said he spoke with the Secretary of Health and Human Services to get to the bottom of the tragedy. He was scheduled to visit the facility Wednesday evening. "This is an inexcusable tragedy that frail patients would die of heat exhaustion without it being recognized and taking them to the hospital next door," Nelson said in a statement. A third nursing home in North Miami Beach that lost power had contacted police, city and state officials asking FPL to restore power. The Douglas Gardens Community Health Center said it has one generator powering only the kitchen. The Hollywood stop is a "common stop" for fire rescue crews in the city, said Raelin Storey, spokesperson for the City of Hollywood. "Our fire crews have responded to this facility 127 times over the last 12-month period," Storey said at a press conference Wednesday evening. The Centers for Medicare and Medicaid Services, which regulates nursing homes, gives the Rehabilitation Center at Hollywood Hills a below average rating, two stars on its five-star scale. But the most recent state inspection reports showed no deficiencies in the area of emergency plans. In 2015, Larkin Community Hospital acquired the rehab facility and adjoining hospital, formerly known as Hollywood Pavilion Hospital, in a bankruptcy auction after its former CEO was convicted of running a Medicare fraud scheme, according to a Larkin press release announcing the purchase. Karen Kallen-Zury, Hollywood Pavilion's majority owner, was sentenced to 25 years in prison in 2015 for fraudulently billing the government more than $39 million. The 152-bed rehabilitation center was fined $5,500 on Feb. 18, 2016, according to a Medicare website. A 2016 inspection report dated the same day noted a series of deficiencies. It said that the center had failed to provide daily living activities, leaving one woman in her nightgown facing a television that had not been turned on and in a room with the curtains drawn and the lights out. Another man had long, jagged fingernails with a black substance under the nails on his right hand and a thick yellowish spongy substance under the left hand fingernails, according to the report. His skin was fragile with multiple bruises and scratches on both arms and he was unshaven. Dentures, glasses and hearing aids were not provided to residents, the report noted. 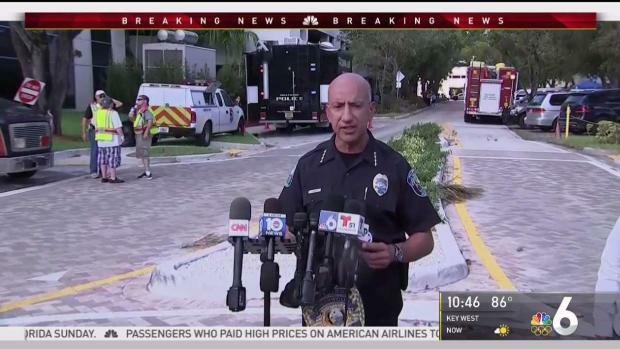 Police say they are launching a criminal investigation after five people died at Larkin Nursing Home in Hollywood, Florida. The center also failed to provide housekeeping and maintenance needed for a sanitary building. Paint was peeling, a sink and tiles were cracked, a door was rusted, trash was overflowing, doors were dirty and a soiled wheelchair was left in a room. The director of nurses, when told of the observation, responded that she could not understand why the nurse had performed so poorly because she had watched the nurse wound care in the past with no issues, the report said. A report in March found that one woman had had only two showers between March 10 and March 20, though she was supposed to be on a schedule of three showers a week. In addition, two of 10 residents surveyed had not been assessed for what care they needed within the required timeframes. A coordinator acknowledged during an interview that the center was a year behind in completing the assessments for one resident. In the kitchen, instant mashed potatoes and pureed vegetable were boiled for up to three hours, food was not being stored and served safely, according to the report. A micro-wave oven was soiled with black matter, the wall near the serving area had dust and dried food on it and small black insects were flying near a bin of uncovered fresh onions, the report said. The center failed to dispose of garbage properly. Helicopter video shows the Rehabilitation Center at Hollywood Hills being evacuated. At least eight residents died after a power outage in the wake of Hurricane Irma. "The entire ground area including the alley street area was strewn with trash, garbage, plastics, and used nursing/medical supplies," the report said.